Stealth Cam SD Card Reader and Viewer is equipped with a 4.3” LCD that gives you a clear view of the photos and videos taken. This product reads your SD card and enables you to view them. The device can read multiple formats and is easy to access. This product is used for only viewing the photos and videos captured. The product has an audio jack that enables you to hear the recordings recorded. Once you eject the SD card from the card reader, it does not affect or damage the quality and the quantity of the photos and videos. The data stored in the SD card will not be subtracted or added. The product reads various types of SD cards. It can read and view regardless of the camera’s brand. 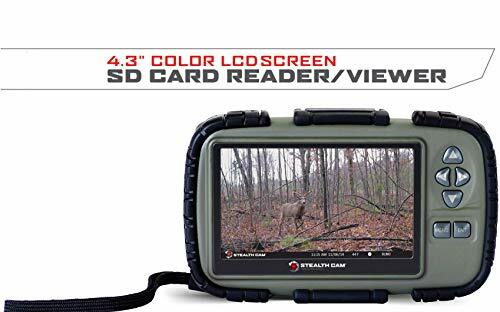 The reader reads what the game trail camera gives so if your camera doesn’t have a night vision then this product would not provide for its night vision or night light. This product doesn’t have internal storage. Stealth Cam SD Card Reader and Viewer works just as advertised and it allows you to scroll quickly. This is in case you need to search for a specific photo or video. You can adjust the brightness of the screen according to your liking. This product can handle wild game camera shots as well. You can format the SD card using this product but you can not take photos, it only views and deletes. The camera you are using will be the ones to take photos and you can then view those by using a USB and inserting it into this product. The reader loads quickly which eliminate long waits and buffering. The camera is easy to bring with you because of its lightweight and it helps in monitoring your previous shots. You can take it with you wherever you want to. The product can view up to 6 icons at a time. However, like typical readers and gadgets, it can also experience lags and freezing moments. You can no zoom in the videos but you can, of course, have a zoom in for the photos. You can only delete one photo at a time which, in case of mass deletion, will take time. You can not also save pictures from the SD card to this device, it can only read and view the data. The screen could be hazy and unclear for persons who have eye difficulties. You need to purchase a separate charger when you buy this product. the charger used though, is quite easy to find. The battery life depends upon how long and how often you use the product. There are times when the product cannot load or read the sd card. In these times, you should just eject the card and then put it back again and it will then be registered. The product works well and is easy to access regardless of age ranges. This product is perfect for people who9 loves taking pictures and loves to view them on one device.